Spotify has three main products — the Free, Unlimited, and Premium memberships. When Spotify launched in the U.S., it allowed people to join up for a Free account only if they had a special invitation code, or token. While Spotify moves into more countries in the future, it may issue invitation tokens in this way to avoid a massive influx of initial users. Spotify also offers regular promotions for free trials of Spotify Premium — most of these last for 7 days. Spotify allocates Premium subscribers a quota of special invitation tokens, codes you can send to your friends that, when entered, let them experience Spotify Free. But in September 2011, Spotify allowed anyone to sign up for the Spotify Free product, so there’s really no longer any need for a token. Invitations are still floating around in people’s accounts, and they’ll come in handy when Spotify launches into other countries. Most Spotify Premium subscribers receive two Spotify Free invitations a month, unless they’re in the Netherlands (sorry). Spotify Free provides people with unlimited, ad-funded listening for six months before accounts are restricted (Spotify can’t keep Free accounts going forever if it wants to provide a sustainable service). To see whether you have any tokens to give away, you need to log into your Spotify account and access the Share Spotify page. On the Share Spotify page, you see a section that allows you to recommend Spotify to your friends by entering their e-mail addresses in the text box provided. Entering e-mail addresses here is just a way to let people know about Spotify. To invite someone to Spotify Free, scroll farther down the page, and you see a Your Invitation Tokens section that shows you the number of invitations you have left. If you have any, click the Create Invitation button to access a page of invitation codes, which you can copy and give to your friends. Spotify’s marketing team regularly issues trials of Spotify Premium in a cunning bid to convince you to become a paying customer. Go to the free trial page to find out more about the seven-day trial. For a brief, tantalizing period, you get all the benefits without the commitment. If you already have a Spotify account, type in the free trial web address while you’re logged in to the Spotify website to see whether you’re eligible — usually, only new accounts are allowed to sign up for these trials. To make the most of the free Premium period, you can read parts of this book before you begin and start thinking of ideas for searches and playlists. Every hour counts, and you don’t want to waste time mucking around. If you’re already an Open user and eligible for a trial, keep your calendar free so that you can make the most of your listening hours! You might even want to time your next holiday during a Premium trial period — you can then listen to Spotify’s catalogue by using your cellphone in either Streaming or Offline mode. You still need to enter your payment details to use your free Premium trial because Spotify needs to verify your status and doesn’t want people abusing the service. Just remember that if you don’t want to continue being a customer, you can log in and cancel your account within the trial period to avoid your card being charged (if you do forget, you’re charged for only one month at a time). To cancel your Premium account, go to your Subscription page and follow the link to cancel your subscription. Confusingly, Spotify sometimes offers different types of Premium trials. At one stage, there was a standard 7-day trial, but alongside this offer, it ran a 7-day trial that allowed cellphone users to extend the trial by 30 days. 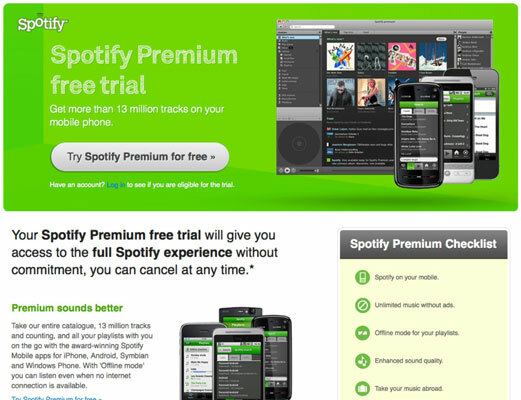 Open users may also see promotional messages within Spotify or receive e-mails after they run out of hours or plays. So, it’s worth looking out for specific promotions because you may get more than the standard seven-day free allowance.